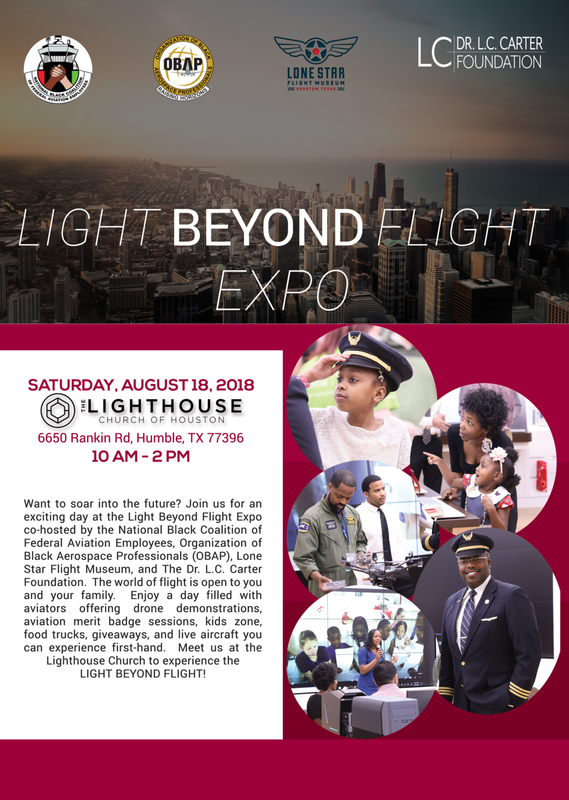 We are elated to invite you to the Light Beyond Flight Expo, Houston’s first Aviation and Aerospace Expo collaboratively co-hosted by National Black Coalition of Federal Aviation Employees, the Organization of Black Aerospace Professionals, the Lone Star Flight Museum, and the Dr. L.C. Carter Foundation. The expo will be held on Saturday, August 18, 2018, from 10:00 A.M. – 2:00 P.M. at the Lighthouse Church of Houston. It is a FREE public event that will include a day of aviation and aerospace education activities such as FREE Aviation Merit Badge sessions conducted by the Lone Star Flight Museum education staff, a rotation of Drone Demo sessions by licensed pilots, kid zone interactive activities spearheaded by the FAA, and three (3) to four (4) aircrafts live onsite to experience the touch and feel of flight. We will also have local food trucks, live music, and a host of about 20 aerospace and aviation exhibitors from flight carriers and educational facilities. We will be giving away prizes and gift cards throughout the expo donated by our exhibitors and co-host, with special set asides for students gearing up for back to school.